Those fabrics are cute, Marci! Can't wait to see what you are making! Darling fabrics, that's for sure! 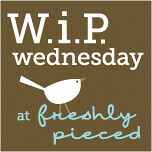 Linking up occasionally (or even frequently) and focussing on one WIP at a time sounds like a great idea! I have been trying to be "single minded" with my out of control WIPS too! I love that fabric! I used it in a charm swap, and I also included a couple of extra pieces in the back of my kids' camping quilts. Can't wait to see the finished product!